Even if you’re not planning on selling your property in the very near future, it’s important that you are constantly making improvements to your home and property to boost its potential market value. One way to do this without spending tons on renovations is to add a portable, freestanding shed, garage or barn to your backyard. Make sure you check in to your neighborhood’s zoning and permit information before you build, and confirm that there are no homeowner’s association rules that prohibit free standing sheds. Once you’ve dotted your I’s and crossed your T’s, check out Deer Creek Structures’ high-quality selection of sheds and barns and decide which would be the best fit for you. Adding outdoor storage space appeals to a large majority of property buyers, notes Sarah Smith, writing for Realty Times, which means that your home’s value will likely increase with the addition of a shed or barn. Remember that how much the value increases will depend heavily on the market trends in your neighborhood – you can do some research and find some comparable properties to know for sure what increase you can expect. Plus, keep in mind that only a well-built and well-maintained structure will do you any good when it comes to asking price – a dilapidated, worn-down building barn will detract from your home’s value. 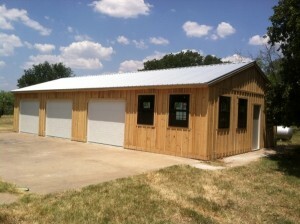 Buyers who are handy or crafty will appreciate the extra outdoor space to store tools and home improvement equipment. For a home with a large lawn, a shed or garage can be a great place to store landscaping items like a lawn mower. Plus, a typical family has two cars, so if you opt for a large barn structure that can accommodate vehicles – or even recreational vehicles, like motorcycles, four-wheelers or snowmobiles – this extra space for storage can definitely tip the home-selling equation in your favor. These are just some of the benefits that potential buyers in the future might enjoy when you put your property on the market. In the meantime, you’ll be able to use the shed or barn however you see fit, so you and your family will benefit from the installation now as well as when you sell your home. For more information on our freestanding portable sheds, garages or barns, or to find out more about custom structure designs, call Deer Creek Structures today at 254-546-2276.